You can reach us from Mo – Sat. from 11:00 – 19:00 by phone or via email. During your first appointment, you will be measured and your personal cutting pattern is created. 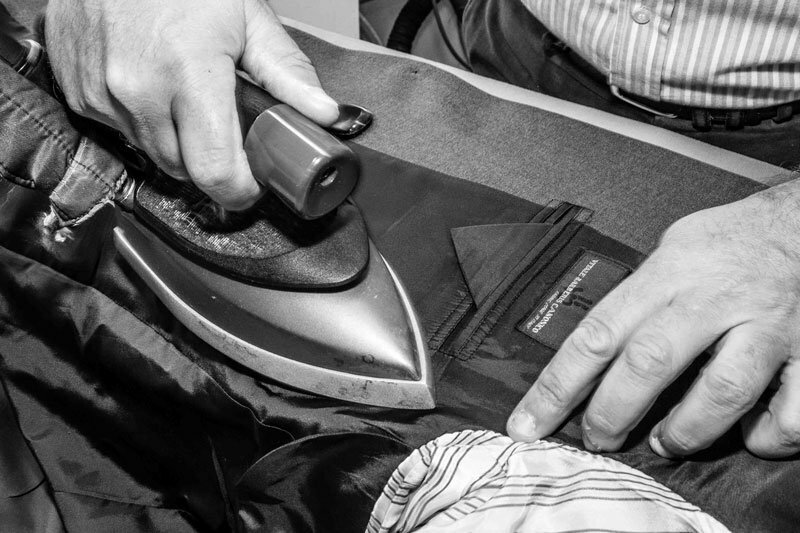 Together with one of our tailors, you will choose all the necessary ingredients and options for your future bespoke suit, tailored coat, made-to-measure trousers or shirt..
After about five weeks, you can come in for the fitting of your finished garment. If further adjustments need to be made, we’ll do it within a few days in our studio. Your cutting pattern is saved. This allows you to be able to comfortably order your suit, dress shirt, coat or trousers in your size and fit in the future. We can always make alterations to your cutting pattern at any time. contact us via E-Mail at: [email protected] or use our Form. Of course you are free to visit us without an appointment and to browse through our assortment of products. How long does it take to make bespoke or made to order garments? The production of our tailor-made shirts, coats and suits usually takes 5 weeks. Any adjustments and fine alterations may take another 1-2 weeks. We recommend you to schedule about 7 weeks for important occasions such as a wedding. The manufacture of our tailor-made jeans and chino pants usually takes 4-5 weeks. Again, any adjustments and fine alterations made on the second visit may take another 1-2 weeks..
We need about 6 weeks to manufacture our made-to-order-men’s shoes. Subsequent alterations to our garments are subject to charges. We do not offer alterations on garments which are not ours.